What’s It Really Like Working At A DOE National Lab. I don’t have Netflix or even a TV, so I haven’t seen Stranger Things other than some ads on You Tube. This post turned up and I thought that I would share my experiences working at a DOE National lab. The author of the post is a little retrained so I thought that I would liven things up. Hawkins National Laboratory Doesn’t Exist. In the show, Hawkins National Laboratory is a tightly secured Energy Department facility in the middle of a deep, dark forest. The truth is Hawkins National Laboratory — just like the fictional town of Hawkins — doesn’t exist. However, one of the National Laboratories has a forest connection! Argonne National Laboratory in Illinois is named after the surrounding Argonne Forest. Established in 1946, Argonne is America’s first designated National Lab and was founded to continue Enrico Fermi’s work on nuclear reactors. Argonne is now a multidisciplinary science and engineering research center that focuses on important energy, environment, technology and national security issues. Learn more about the Energy Department’s 17 National Laboratories. Ok maybe the building is appropriate because it’s old and dilapidated. A lot of the buildings on a national lab are retreads. The National Labs were created out of the old Manhattan project, the sixties science boom and still have that used look to them. Even when they have new facilities built you try to scrounge as much as can. There’s probably a lab near where you live. It’s worth the trip to see real cool stuff on one of their open houses. The Energy Department Doesn’t Explore Parallel Universes. There are several scenes in the show where Hawkins Laboratory researchers don full body suits and protective gear to walk through a peculiar portal, which transports them to an alternate dimension known as “The Upside Down.” While the Energy Department doesn’t chart parallel universes, it does help power the exploration of new worlds. We’re talking outer space, not the bizarro cosmos in “Stranger Things.” For instance, the Energy Department makes nuclear batteries called Multi-Mission Radioisotope Thermoelectric Generators for NASA. These batteries convert heat generated by the decay of plutonium-238 into electric power and were used in deep space missions like the Viking mission to Mars in the 1970s, the Voyager interplanetary space missions, Curiosity Mars Rover, and New Horizons — which flew by Pluto last year. For the first time in 30 years, researchers at Oak Ridge National Laboratory recently produced 50 grams of new plutonium-238, which could be used in future space missions. Check out this cool infographic to learn more about the Energy Department’s role in space exploration. Dark matter with lasers, yes. Parallel universes, no. Though there were some very weird talk given, so who knows. But I doubt that anybody would get a budget for parallel universe research. The Energy Department Doesn’t Mess With Monsters. “Stranger Things” depicts the Energy Department as a federal agency confronting terrifying monsters lurking in different dimensions. We don’t mess with monsters, but the Energy Department is in the business of detecting invisible dangers. Energy Department scientists throughout the country create new technologies that help prevent terrorists from getting their hands on nuclear materials. For example, Sandia National Laboratories developed a mobile scanner that can be used in shipping ports around the world to quickly detect radiological materials hidden inside massive cargo containers. Any monsters that had to deal with the people I worked with would run away, very fast. As would any aliens or supernatural beings. these are people who play with intense radiation and high energy lasers as big toys. That is if they weren’t friendly. National Laboratory Scientists Aren’t Evil — They’re Actually Really Nice (and Smart)! In “Stranger Things,” actor Matthew Modine plays Hawkins National Laboratory’s Dr. Martin Brenner, a sinister scientist whose motives are questionable. However, actual National Laboratory scientists are among the brightest people in the world, working hard to solve the nation’s toughest energy problems. And not all of them are men! Meet some of the inspiring women scientists who work at the Energy Department. Of course being friendly with the people at a DOE Lab is easy because they are the greatest people ever. They like their work and life in general. If the monsters had the right knid of weirdness they might fit right in. I’ve worked at a lot of different places right now but my two years at Thomas Jefferson National lab (Jefferson Lab) were among the best of my working life. From a working as a designer or engineer they were certainly the most rewarding. What made it rewarding is that Jlab at least attracted great people. If you looked at the offices we had things would look sort of dumpy, but the people made the difference. Here’s my office. It was in a trailer, so all those fancy stage sets or elaborate fancy buildings and super sophisticated HQ with secret entrances and all that. Nope. If were lucky our desks were not from the WW2 era. Mine looked like it came from Sears. That table in back probably did come from that era. I don’t think any of us cared. Because we got to work on stuff like this. One thing about an accelerator is that the only time it is finished is when it gets decommissioned. So the work is ongoing and unending. It’s also going to be a product of improvisation and hack jobs of stuff used for other purposes. There’s no such think as an off the shelf for accelerator parts. One thing about working at a National Lab is that you have that sense of working in big stuff, that you are working on something significant and important. There was also the fact that while you were at one lab, you were part of a community of labs that shared technologies and ideas. You also get to paly beyond the cutting edge. You are always looking for that new thing to make some far out thing possible. At a National Lab failure is always an option, but that’s Ok because if something fails you learn from the failure. As they say, a null result is still a result. Working at a lab means that you work with great people. In fact that’s the best part. The people are sharp and love to have a positive outlook. It’s the great people that make our national labs what they are. People like m my friend Dr. Shinn who is as far from the image of the dark mad scientist as you can get. Here she is explain lasers to an audience including kids. Here she is explaining laser. 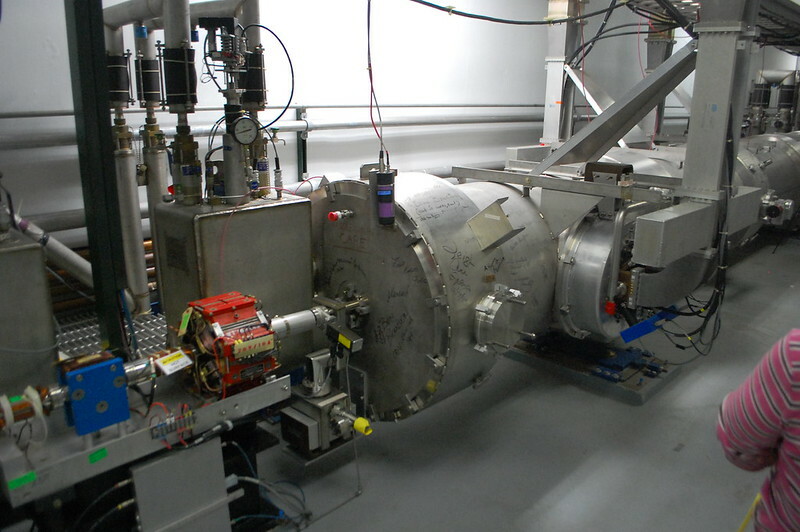 The Jlab Free Electron laser was my main focus there for two wonderful years. We need more scientists that think like artists The national labs tend to foster that kind of creativity. That’s part of what makes them such great places. Here’s Jefferson lab’s YouTube channel. Here’s John Saunders And Tom Lipton visiting Berkley Labs. Here’s a small of pics that I took on my last trip to Jlab. I know that this is never going to happen but I wish that Hollywood would at least try to get what happens at the National Labs right. There’s so much cool stuff going on in real life. I think that going through the life of an experiment from conception through design, testing, failure, more design, more testing, insertion into the beamline and results would make for a great reality TV drama. Instead Hollywood seems to be determined to keep repeating the same old tropes about evil mad science. As far as I know, while there may be crazy science going, none if it’s mad or evil. Or even very scary. Part of my Naval training was at what was then called Idaho National Engineering Laboratory (INEL), so your post brings back memories. Protection of government property and the constant re-use of furniture and equipment by different projects/contractors/site areas meant that many items had a profusion of inventory labels. If one bent over to pick up a dropped pencil, you would see a row of 6 different ID tags glued to the bottom of your desk. It was fun to try figure out when your desk arrived on site, and for which project. Some items had very long histories. I recall the site diesels (backup generators) were surplus from the First World War. Interesting things to note during the long winter nights.